Last year I joined the TAST “Take a stitch Tuesday” embroidery challenge and reached stitch 20 before starting back at school and the enormous amount of homework this brings (I’m studying website design and technologies). Halfway through the year I managed to finally have a break with no homework and started to feel a bit lost in the creative department, so out came the embroidery again. I made four samplers for stitches 21 to 50. (I didn’t work the stitches in any particular order). I discovered that arrowhead stitch is perfect for couching down baby ric-rac. If you lay a strand of something thick down the centre before couching it’s barely recognisable as ric-rac. I don’t like 6 thread embroidery floss as the interlacing in the interlaced cable chain. I also like the rows of chains quite a wide distance apart, to give the interlacing room to show it’s diamond-like design. Pekinese stitch has been a favourite of mine since I was little so I used it to couch down a flower cut from an old doily as I hadn’t used it for that before. I think if I hem the appliqué it’s an especially nice finish though I do like it with the raw edge too. All the other stitches I tried in a range of threads, all of which I think worked well. I especially like the cabled chain stitch on the bottom right with beads stitched in the centre of each chain. I tried all the stitches in as many different threads as possible. For me, the stand out features of these stitches include using closed base needlewoven picots for the leaves on the buttonhole cup flowers. 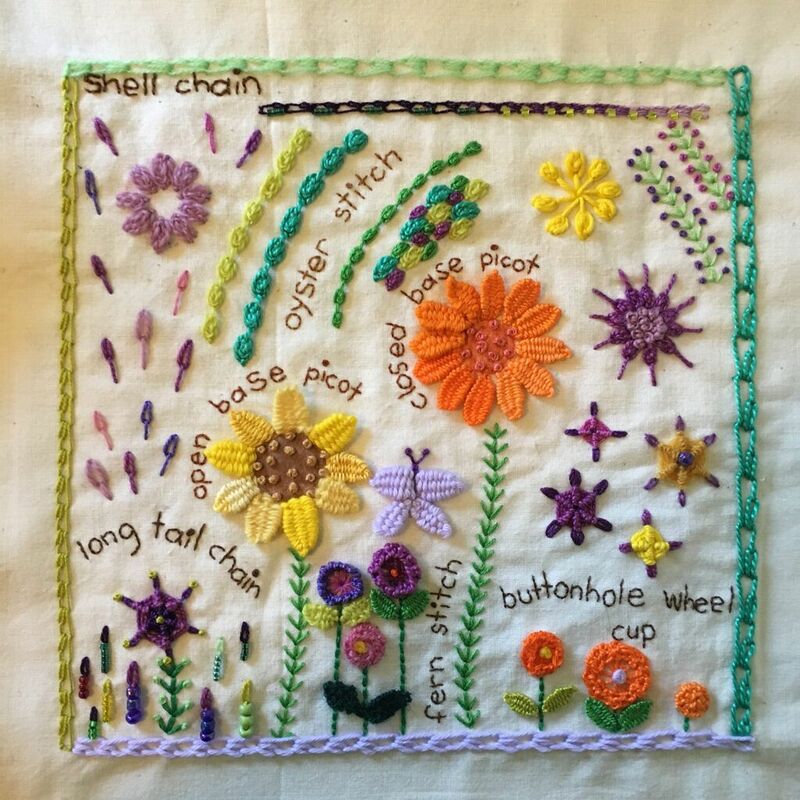 I also really love the oyster stitch worked in rows, and the buttonhole cup flower with the purple centre and indigo stitching around the cup. I think the layers of colour worked really well. I’d like to try the shell chain stitch with 3 or more chains side by side. I think two works really nicely but it would be interesting to work several so you’d have a stack of shell shapes in a line. 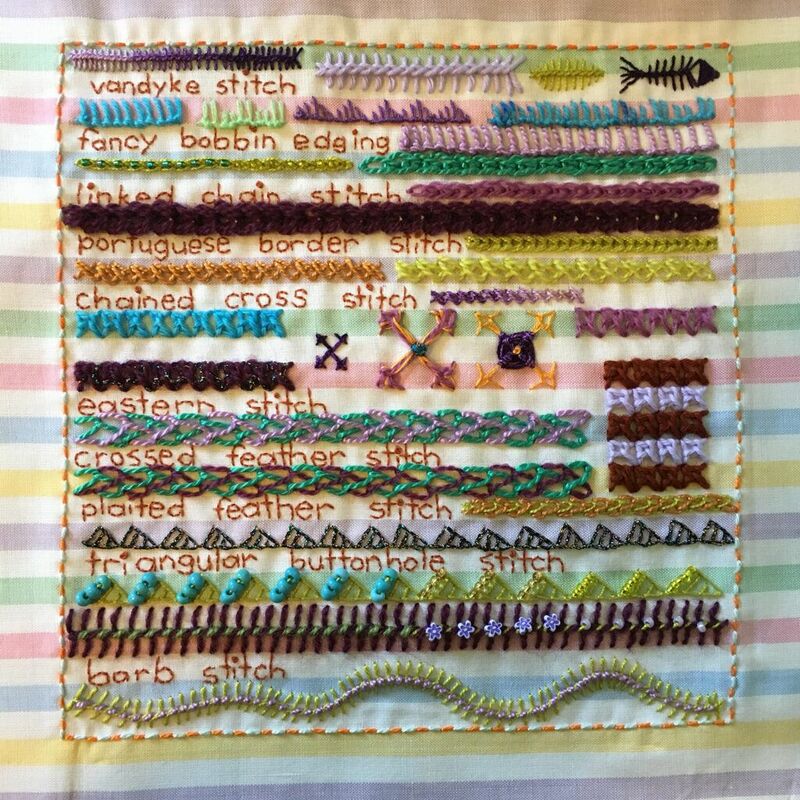 Vandyke stitch (I love the fish). I really like this stitch worked in thick threads. It makes a great leaf as well. Fancy bobbin edging. I want to try this as an actual edging stitch over a hem because I really hate it worked flat. 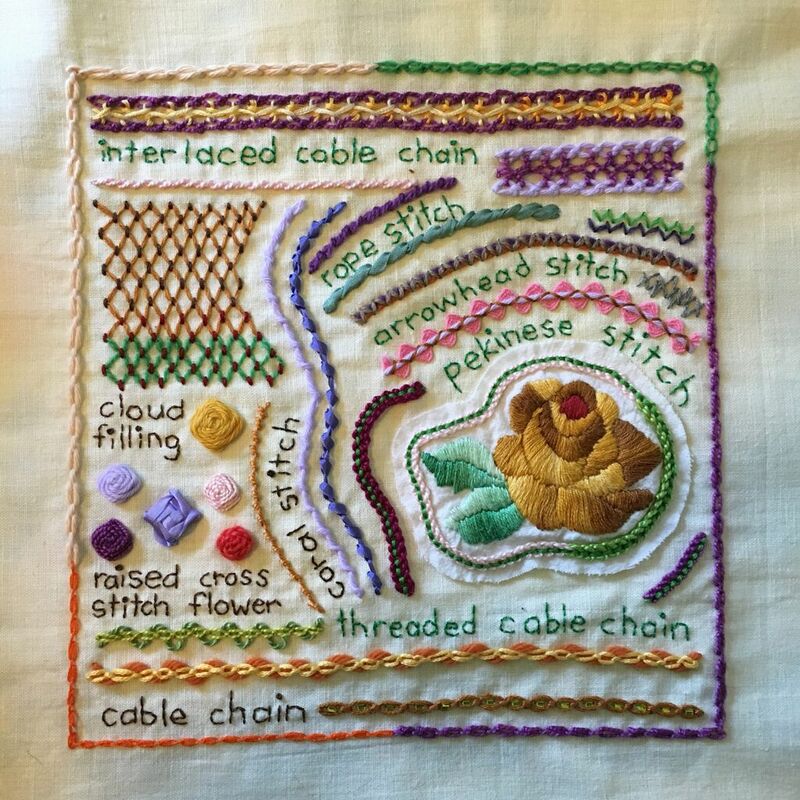 Linked chain stitch. My favourite is the green linked chain on the left with dark green beads. It’s a nice textured stitch worked with thick thread, and very elegant worked with fine mercerised cotton and tiny beads. Portuguese border stitch. I would love this stitch worked in almost anything but the fine mercerised cotton version in lime green is particularly nice. Chained cross stitch. I’m not a big fan of this stitch. I think it’s OK. It’s easy to work and looks neat in a large range of threads but it doesn’t thrill me. Eastern stitch surprised me. I didn’t think I’d like it but the stripes worked in soft needlepoint cotton are very interesting. This is another stitch that looks great in whatever thread you use. Crossed and plaited feather stitch. Feather stitches of all variations will always be a favourite of mine. I stitched these in size 3 mercerised cotton so I would remember the difference between the two stitches. Triangular buttonhole stitch. I originally worked this on my second buttonhole stitch sampler but wanted to try it with beads this time. I think the medium sized beads work particularly well. Barb stitch. I also originally worked this on my buttonhole stitch sampler but I wanted to try it beaded and worked on a curved line. I’m not keen on the way the beads move about, but I think the curved and wavy version worked in size 8 mercerised cotton is beautiful. Catch up sampler number 4, in which I got totally carried away with fabric paint. I found some Hobbytex paints at the op shop (charity shop/thrift store), and decided to paint the names of the stitches and the background of each flower to save time so I could go on to the new stitch for week 51. It didn’t quite work out that way because I smudged the names of two of the stitches so I ended up embroidering them all anyway! In the end I didn’t mind because my samplers are all about recording different things I wanted to try, so that’s another experiment on record. Bonnet stitch. I didn’t think I’d like this stitch at all but it turns out that I love it. Along the top I worked it in two strands of size 12 cotton. The green is matte and the purple is perle. I used it to couch down threads on the right hand border, and finally for the petals on the four largest flowers. If you close the tips of each “V” on the bonnet stitch with an arrowhead stitch you get diamond shaped petals. Knotted cretan stitch. 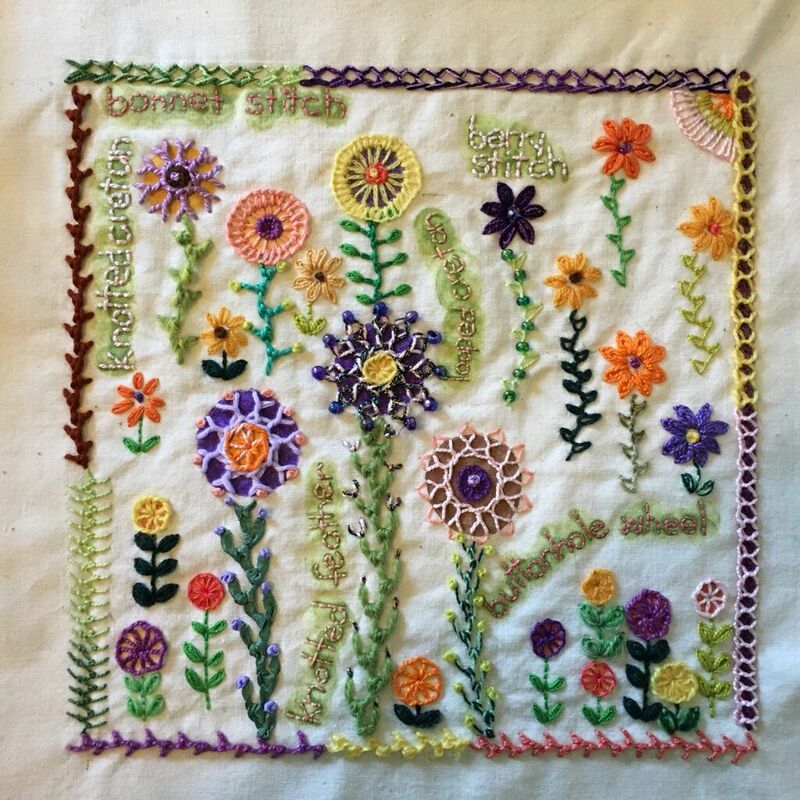 I used French knots and berry stitch to turn knotted cretan into flower stems with buds and leaves and used lots of different threads to stitch the remaining two borders. I prefer knotted cretan worked in long lines rather than short but the berry stitch leaves are fun. Looped cretan and beaded looped cretan stitch. I could embroider this all day. It has a lovely rhythm and I really like it worked in various sizes with different thicknesses of mercerised cottons. Berry stitch. I’ve always used berry stitch to embroider simple eyes on knitted toys. I like it worked in crewel wool and size 8 mercerised cotton the best in these samples. Buttonhole wheel. I used small buttonhole wheels in a number of different threads to work the tiny flowers, and with two rounds of buttonhole stitch for the larger flowers. When working more than one round I like to stitch them at different densities to add even more textural interest. If your buttonhole wheels start to fold over, a second round of stitches will fix it. Or you could unpick it and work the stitches closer together. Knotted feather stitch. This is another stitch I’ve worked a lot before so I tried it in some different threads. Silk ribbon, two strands of DMC Floriella crewel wool, and two strands of DMC Medici wool. The stem on the middle flower is a bit thick for the size of the flower but again, I see my samplers as a record of things I want to try and that will remind me to use one strand of wool or make a big a bigger flower next time! At the top left is four stacked and offset rows worked in crewel wool. Orange size 8 mercerised cotton on a curve. Size 10 mercerised cotton in green, couching down 5 strands of crewel wool in 2 shades of purple. 2 opposed rows of buttonholed herringbone worked in size 12 cotton with cross stitches and French knots. I think the herringbone stitches are too long worked in cotton this fine so I tried it again underneath with shorter stitches, which I think look nicer. And finally, worked in 6 strands of embroidery cotton floss, a flower! The French knots in the centre are worked with three strands. I found this stitch incredibly fast to work and liked it in all the threads I tried. I can’t wait to find out what stitch we’ll be trying next week!